The current Auberge de Provence is to be found in Republic Street in Valletta, right at the heart of the capital. Designed and built under the direction of Girolamo Cassar between 1571 and 1574, it housed the group of the Knights of Saint John belonging to the langue of Provence. The French, who accounted for two-thirds of all the Knights of Saint John, traditionally maintained three Auberges within the Order, the Auberge de Provence, the Auberge de France, and the Auberge d’Auvergne. Unfortunately, these last two were completely destroyed during World War II. Originally, the first Auberge de Provence, like the other Auberges, was built in Birgu, and shared a façade with the Auberge d’Auvergne. Later, these two Auberges were both rebuilt as separate and larger structures and relocated within the city of Valletta. The architect Girolamo Cassar, who was assigned to build all the important buildings in Valletta at the time, embossed the façade of this Auberge with his usual Mannerist style, however when compared to other Auberges, the Auberge de Provence has some of the best Baroque architecture in Malta. 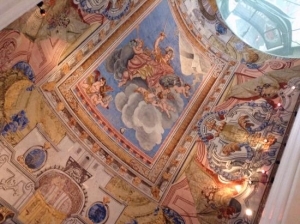 It is mostly known for the Grand Salon on the top floor, with its richly painted walls and wooden beamed ceiling, attributed to Italian artist Niccolo Nasoni. This was used by the Knights as a hall to negotiate important business, as well as a banqueting salon where the Knights feasted seated on long tables, according to seniority. In 1638, the Auberge de Provence was refurbished and enlarged extensively. This work is attributed to the architect Mederico Blondel, who added a new wing to the building, which took the place of the small square in front of the original façade. The current façade was instead built along the alignment of the street. It has pronounced rusticated quoins incorporating alternating bands of protruding rounded and square sections. When Napoleon expelled the Knights from Malta in 1798, the Auberge was vacated. It was later occupied by the British and used as a military barracks, as well as converted into ‘The Thorn’s Hotel’ in the early 1800s. 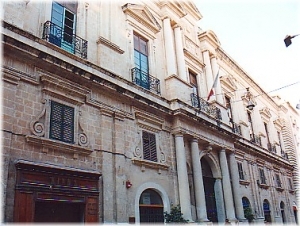 In 1826, it was leased to what was known as the Malta Union Club, which was founded by certain officers and civilians, and which was then the hub of Malta’s social life. Among the Honorary Members of the period, one can find the names of Sir Walter Scott and Benjamin Disraeli. In 1903, the whole of the Auberge de Provence was leased by the Club for 99 years, however the lease held on only until 1955, when it was surrendered to the Malta Government at its request. In 1958, the Auberge was officially presented and launched as Malta’s National Museum. At present, one can find prehistoric exhibits and artefacts from the Maltese islands as old as 5200BC, as well as displays of tomb furniture dating from the Punic and Roman periods. The Grand Salon on the second floor holds temporary exhibitions of particular national interest. The museum is closed on the 24, 25, and 31 of December, 1 of January, and on Good Friday.